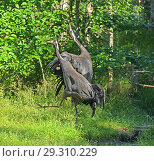 №28390721 Common / Eurasian crane (Grus grus) pair foraging as a third bird looks on, Gloucestershire, UK, February. №25223340 Black-necked crane (Grus nigricollis) in black and white silhoutte. Napa Lake, Yunnan province, China. Vulnerable species.